We know no one wants a root canal, but they are often necessary to save or strengthen a diseased tooth. At his Bloor West Smiles dental clinic, Dr. Kostirko has performed thousands of root canals throughout his 20+ years of practice. With his excellent skills and calm, gentle manner, Dr. Kostirko is able to make sure that his root canal procedures are as simple and painless as possible. 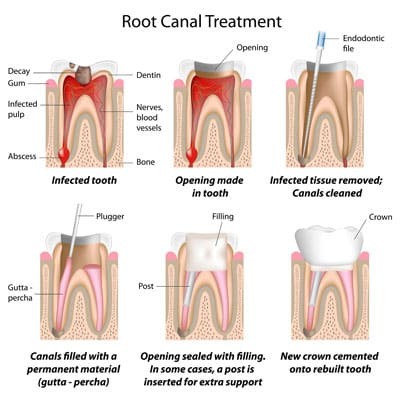 The following steps outline how a root canal is performed in our office. If you'd like more information about this procedure, don't hesitate to contact our team. We can also provide you details on our other dental services. Contact Bloor West Smiles we have methods of helping even the most fearful of patients face their dental procedures with confidence and comfort.